Dr. de Quadros joined the Center in 2002. She board certified Embryologist, Andrologist, and Technical Laboratory Supervisor. She has a Bachelor of Science degree in Biology from Seton Hall University and a Master of Biomedical Sciences degree in Embryology and Andrology from the Eastern Virginia Medical School, where she was the recipient of the Georgeanna Seegar Jones, M.D. Award for Academic Achievement. 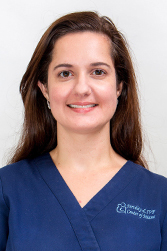 She earned a Doctorate in Health Sciences from Nova Southeastern University where she investigated the sociophysiology of fertility preservation in women.